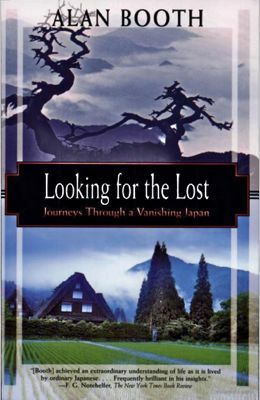 Looking for the Lost is one man’s swansong for the ancient vestiges of rural Japan, a multi-threaded tramp through history and culture in search of something perhaps impossible to find. Our narrator Alan Booth rambles on foot through some of the remotest hills and valleys in the country, legend-tripping the paths taken by various historical figures. He is invariably exhausted, blistered, and sodden with rain, mocked by school-children and construction workers, set upon by alternatingly fierce and friendly mama-sans, in whose company he is witty, gently drunk, erudite, and hailed as a bit of a celebrity in the karaoke booth. The book begins with Booth headed for Tsugaru, a little town at the ‘North Pole’ of Honshu in Aomori prefecture, tramping in the footsteps of a 1944 journey made by the poet Osamu Dazai, for whom it was a return to the land of his childhood. As ever, Booth is beset by rain and heavy winds as he ploughs up narrow valleys towards the Tsugaru Straits. He admires little Buddhist statues, faces worn away by long years of protecting the roadside, at the same time as he dispassionately recounts the details of huge newly constructed bridges, roads, and the exorbitant undersea tunnel project to connect Honshu to Hokkaido beneath the Tsugaru Straits. The legend-tripping concept allows for a deeper and fuller understanding of the place than otherwise possible. We see the land through not only Booth’s eyes, but also through those of his predecessor. For Dazai, his travels in Tsugaru and the resultant book formed the apex of a career and life filled with drunken histrionics, imprisonment, and bed-ridden sickness, in search of a nursemaid he felt he was in love with. In the second part, Booth tracks the long retreat of Japan’s ‘last true samurai’, General Takamori Saigo, who fought against the tide of modernisation in Japan, and the coming abolishment of the Samurai way. He was killed in the climactic battle of Shiroyama in 1877, with a force of 400 samurai dwindled down from 40,000, out of ammunition and armed now only with bows and swords, against the forces of the Central Government armed with howitzers. The movie ‘The Last Samurai’ was based on his life, with Ken Watanabe as Saigo. The third part sees Booth tracking the ‘Heike’, refugees from a 12th century war who fled to all remote corners of Japan, infusing the local areas with their courtly arts and knowledge of craftsmanship. On the final page of the book, after Booth has reached the end of his journey, gotten a little drunk, watched awkwardly some cultural dances surrounded by teasing school-children, and had an odd run-in with the owner of a local ryokan, he tells us of the first stirrings of pain in his gut, which, 27 months later, would be diagnosed as colon cancer and would lead to his early death in 1993, one year before ‘Looking for the Lost’ was published. This knowledge, that we are reading the last work of a man who by all rights should still be alive, infuses the work with a thick sense of loss, an ambiguous kind of fugue that can be recognized in so much Japanese literature. It is the knowing sadness of transience, the wisdom of the cherry blossom that blazes so brightly for only a short time, then must die. But in following the stories of great legends, while adding on his own humorous, kind, and gentle discoveries and interactions, Booth has almost pre-empted this cycle of loss and rebirth, writing himself into it knowingly and without pretense. Dazai went, and saw, and shared what he felt in a blur of drink and self-discovery, then passed on. Saigo fought for his life, retreating to a battle-ground where he knew he would die, but at least die still a samurai. The Heike escaped, those that were able to, and started a new life in new places, the vast bulk of their heritage and culture lost along the way. And then there is Alan Booth, a mild-mannered Englishman, a traveler from another world, who brought (and still brings) their stories to life for a much wider audience, while at the same time sharing his own story, of a young man at once enchanted then disaffected by the glories of Japanese theater, searching for something that he may or may not have found, whose life was cut short in its prime. This is a great book, and is one of my favourite Japan-orientated books, surpassed only perhaps, by James Clavell’s Shogun. Great post, and a welcome reminder of a fantastic read. Now let me see if I can dig it out..
Looks like an interesting read, along with Lost Japan by Alex Kerr. Ryan- I tried getting into Shogun but just couldn’t get to care about the characters. It seems very popular though, so maybe one of these days I’ll pick it up for another go. Morphine- Good catch, he was a writer not a poet, I just got that impression about him from Booth’s book. Lost Japan I didn’t like though, I’ll probably post a review saying why shortly. Alan Booth was a genius as a writer about his experiences, and as a human, also.